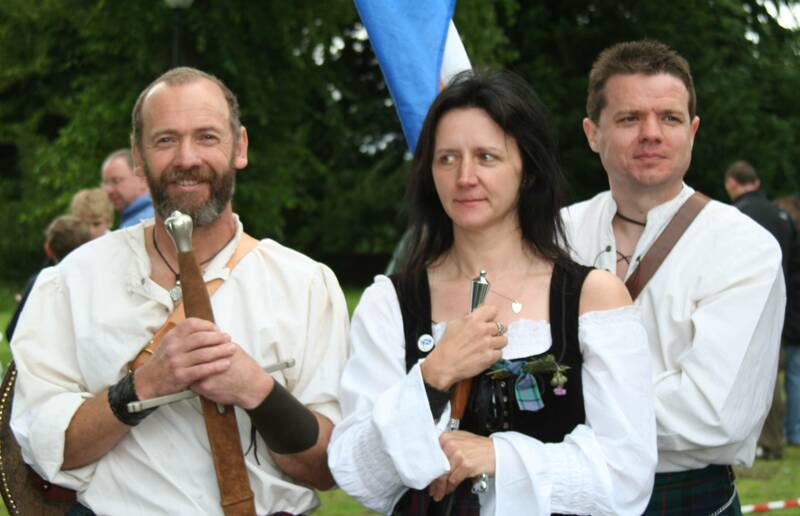 Thanks to Stewart Connor for the write up (http://www.cranntara.org.uk:80/falkirk_cairn2.htm) and Duncan Fenton, Vice Convenor, Society of William Wallace, for the pictures. 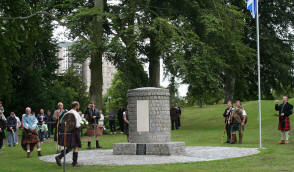 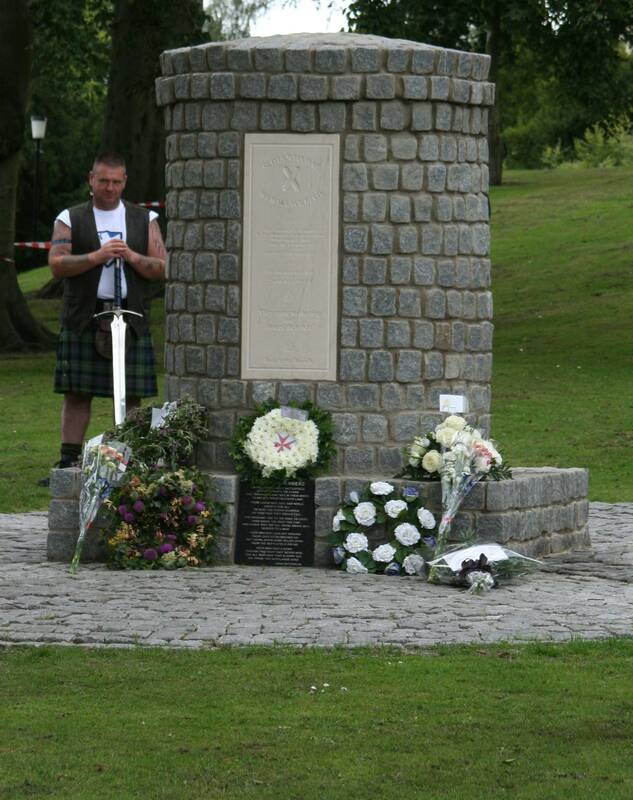 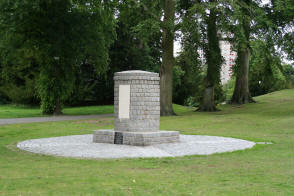 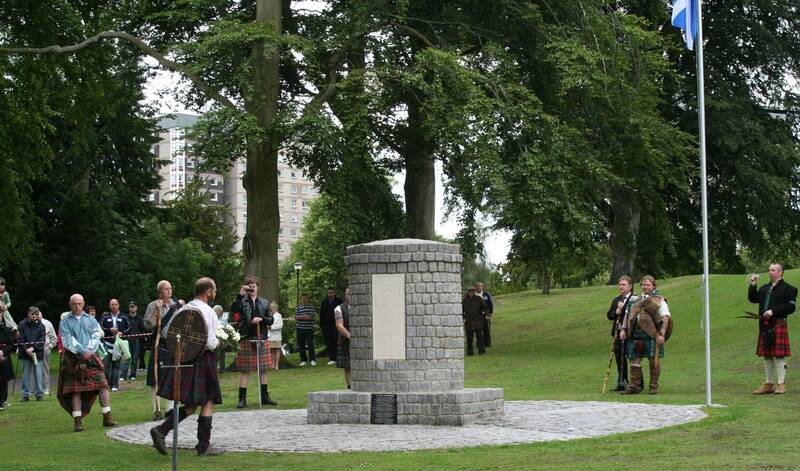 On the nearest Saturday to the 709th anniversary of The Battle of Falkirk 22.07.1298 the dedication ceremony was held to unveil the newly built cairn to the Scots who fought that day against the saxon invaders under the leadership of Sir William Wallace. 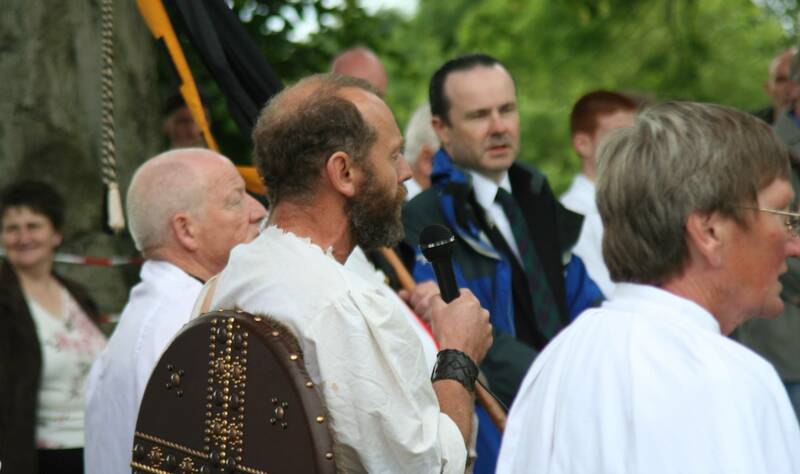 The day dawned dry, warm and overcast with the gathering place of the ancient Fa'kirk chosen for the starting point of the procession through the town to the Cairn in Callender Park. The Kirk grounds are where lie the bodies of Sir John de Graeme, Wallace's loyal comrade in arms and Sir John Stewart of Bonkle who led the Men of Bute on that day and whom were wiped out almost to a man. 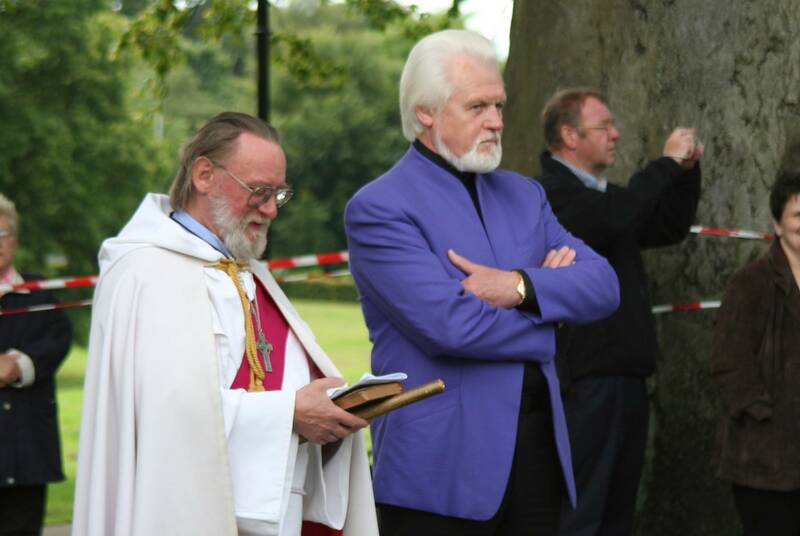 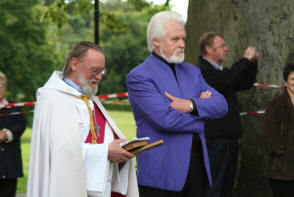 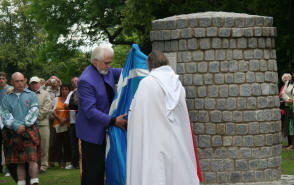 The gathering in the Kirk grounds was attended by many Groups and Patriots from all over Scotland including Ronnie Browne of The Corries, The Society of William Wallace, The Scottish Knights Templar, Crann Tara, Siol nan Gaidheal, Na fir Dileas, The Scottish Fellowship, Various Scottish National Party Constituent Groups and many members of the public. 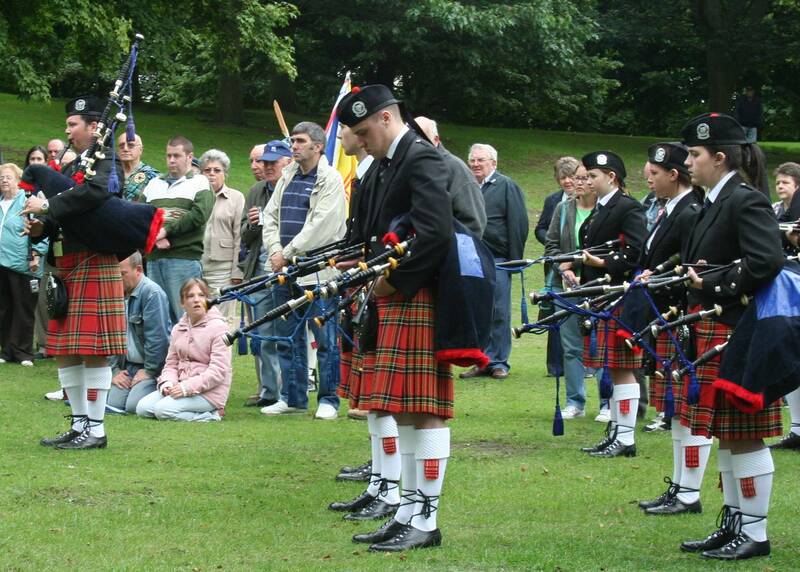 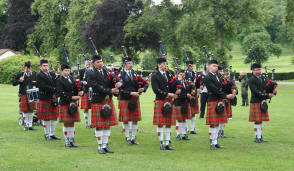 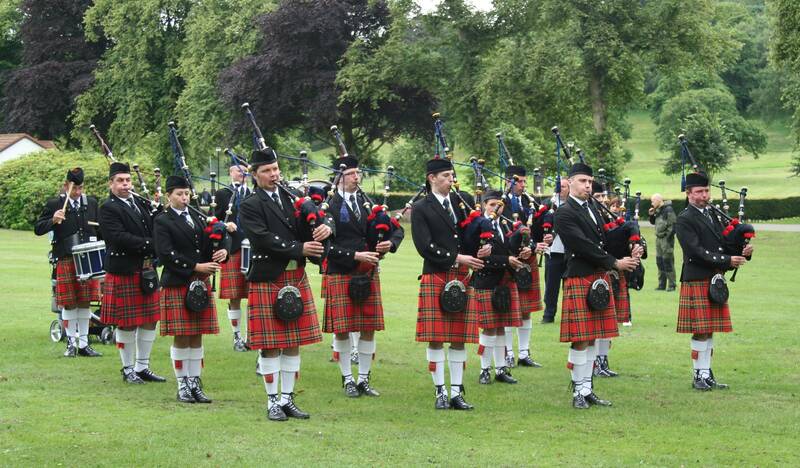 The Denny and Dunipace pipe band were asked to lead the procession through the streets of Falkirk to Callender Park, with Dunipace the location of the chapel where the young Wallace was tutored by his uncle the Priest, this was an inspirational choice. 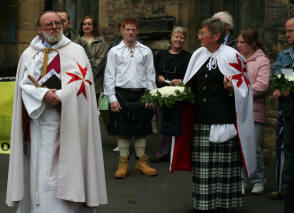 Prior to the muster and leading off from the Kirk, Ken Shira of The Scottish Knights Templar who would act as an excellent MC for the Dedication Ceremony led a small service and wreath laying in memory of Sir John de Graeme, Sir John Stewart and The Men of Bute, where a wreath was laid at the granite Celtic Cross in the churchyard erected in 1877 by the then Marquis of Bute. 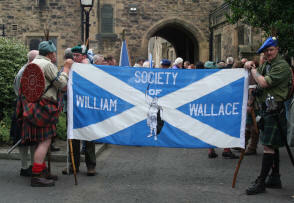 Mustering at 12.30pm the large following set off led by the Colour Party consisting of Gordon, Grant and Stewart, carrying a replica of Wallace's Claymore, the Saltire and The Royal Standard of Scotland. 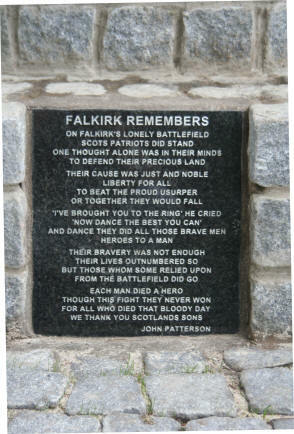 With the Denny and Dunipace pipe band striking up this made a stirring sight as the march wound it's way down the High Street of Falkirk packed with Saturday Shoppers who stopped and paid tribute to the marchers with some even applauding as they went past. 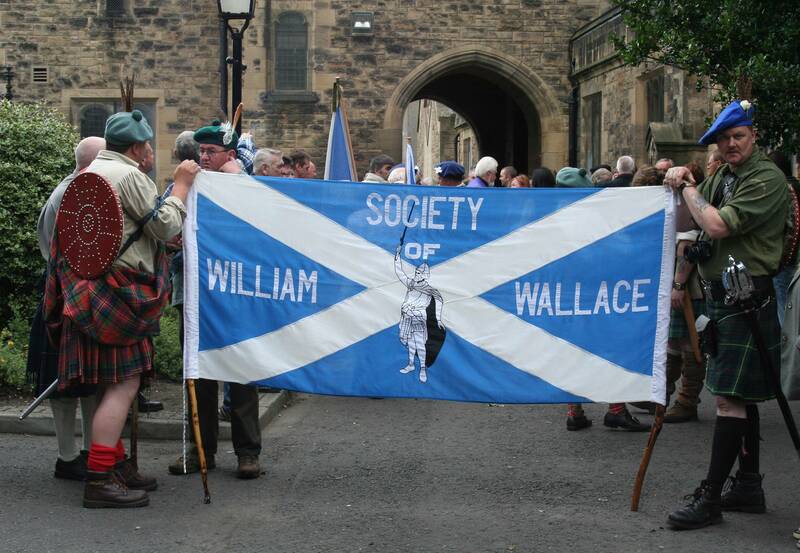 The march continued its way down hill to the entrance to Callender Park and the Memorial Cairn draped in the Saltire used to cover Wallace's coffin on its return to Scotland in 2005 in the Walk for Wallace Year led by David Ross. 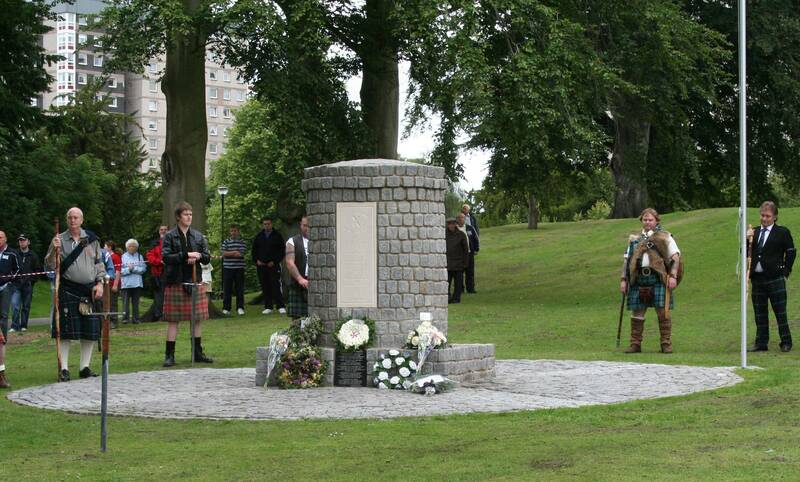 At the Cairn a large gathering in the region of 300 people had assembled boosted by passers by keen to take part in the ceremony. Ken Shira opened proceedings by welcoming those in attendance and distributing the excellent programmes produced by himself. 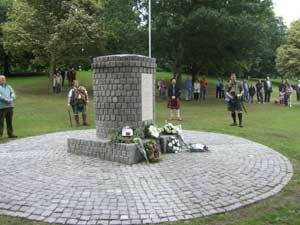 Then from the hill behind the cairn the stirring notes of a lone piper was heard and the colour party re-appeared, marching to the cairn banners flying, where Gordon Aitken placed the Claymore in the ground to act as a cross with an inspirational speech as though Wallace himself had arrived to address his army of Patriots that fateful day. 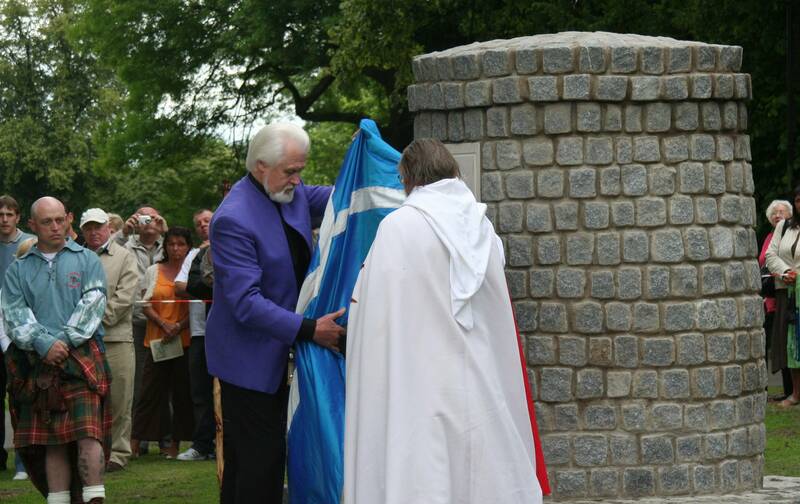 Duncan Fenton of The Society of William Wallace then raised the Saltire on the flag pole adjacent to the Cairn as Ken Shira led opening prayers before handing over to Ronnie Browne of The Corries for the unveiling. This was a moment not to be forgotten and will be remembered by all who attended for many years to come as Ronnie taking the microphone addressed the crowd with the words “I haven't prepared a speech but thought this would be a fitting tribute from a previous battle” and he went straight into their song “Stirling Brig” unaccompanied by music. 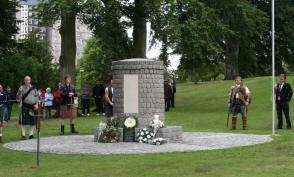 (Truly memorable as it echoed through the park). 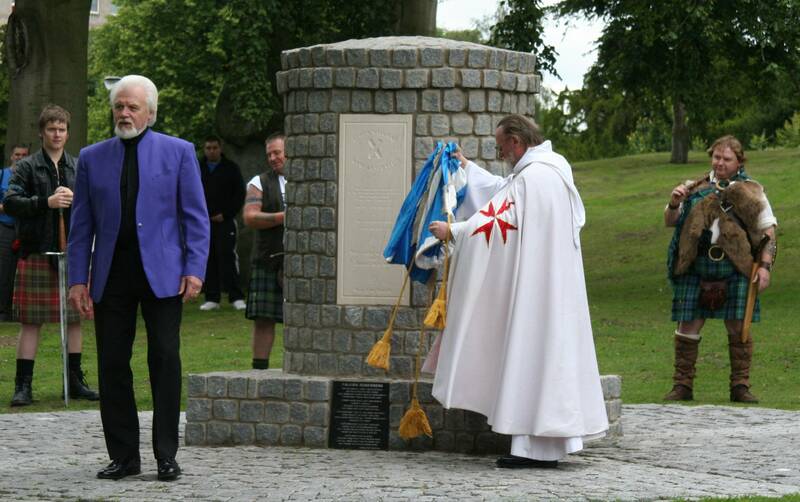 Ronnie continued with the unveiling of the cairn itself, removing the Saltire to reveal the words on the plaque, some penned by Robert Burns another of our famous Patriots which have inspired the concept of Freedom and in memory to those who fought and fell fighting for that very Freedom. 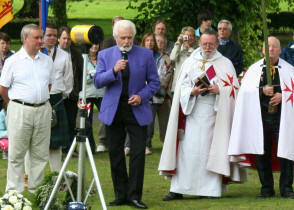 The anthem “Flower of Scotland” was then sung, led by Ronnie Browne. 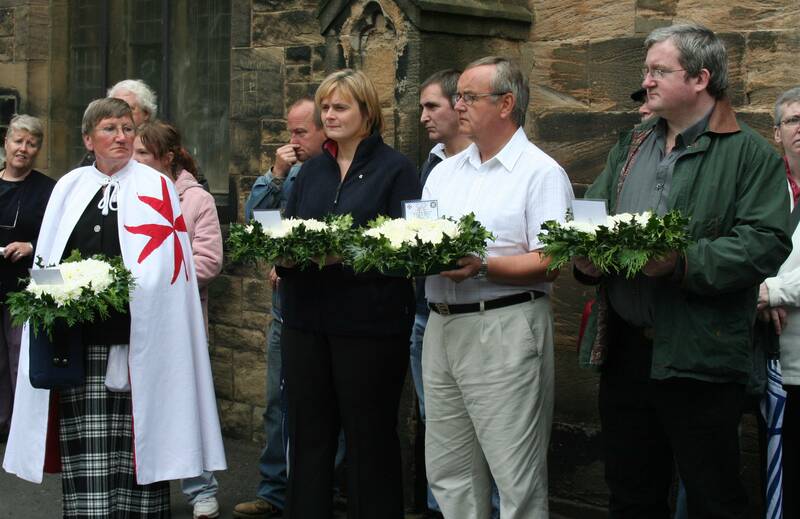 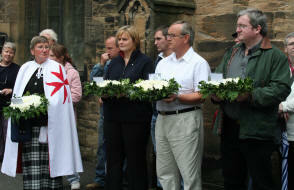 The laying of wreaths followed with tributes laid by The Scottish Knights Templar, The Falkirk Historical Society, The Men of Bute, John Patterson and The SNP Rutherglen. 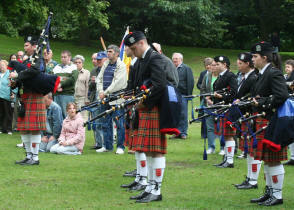 A minutes silence was observed in memory and all colours were dipped and a lament composed specially for the day by the Pipe Major from the Denny and Dunipace band was played to complete the minutes silence and the notes of the pipes echoed gracefully through the park a fitting tribute to those who died that day. Some superb guest speeches followed with John Patterson leading the way with a reading of his poem which graces the base of the Cairn itself. 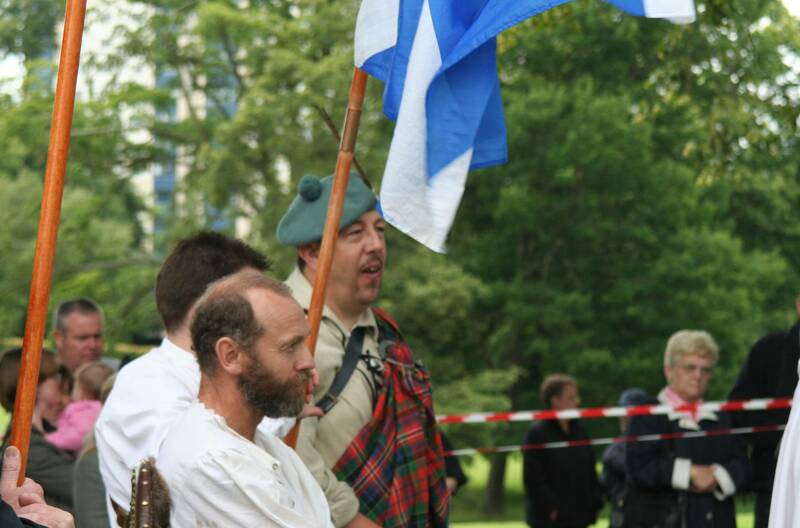 Duncan Fenton of The Society of William Wallace followed with an excellent speech and rounding things off a fine speech from Local SNP Councillor and Group Leader David Alexander. 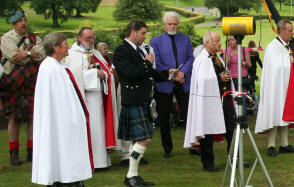 Closing proceedings were commenced with Ken Shira leading a closing prayer then the colour party advanced to the front for the removal of the sword cross with the added assistance of Karen Owens and Julie McCabe who were there throughout the building of the cairn in all weathers and were very able assistants during the construction works. Gordon Aitken removed the sword and a benediction was said with Ken Shira then dismissing all and thanking every one for their attendance, announcing a re-gathering in 12 months time. For those who have not yet made it to Falkirk to see this fitting memorial it really is something to behold and well worth the visit to this part of Scotland steeped in the many Historical events from our proud and ancient past. 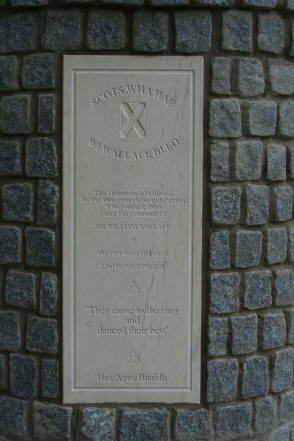 The building of this memorial will be remembered for a very long time and all those who took part in it no matter what or how small that part was, did so with the spirit of Freedom shinning from their hearts that very same spirit given to our proud Nation by Sir William Wallace and those who stood that day at his side against all odds willing to give up their lives for that very same Freedom. 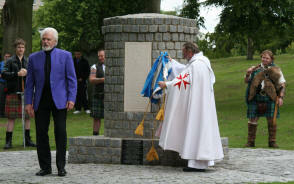 [Left] Duncan Fenton speech [Right] Gordon Aitken & Grant Williamson, the two men responsible for the whole idea & the building of the cairn. With Karen Owens, who also built the cairn.